Phil Macquet was born in 1967. During his studies at art school where he learnt to master classical techniques such as oil painting and drawing, he also discovered an interest for the street and underground means of expression: the punk rock scene, performances, happenings – a whole world crying out to be discovered. He was 16 or 17 when he first had the idea to paint directly on urban features using stencils and spray paint. This interventionist, often transgressive artistic act with elements of humour and poetry came to life thanks to Macquet and his friends in the North of France, Paris and Nantes. It was rapidly given a name: “street art”, “urban art” in the US this is often used in opposition to “free spray”. For Phil.Macquet, the experience remained stimulating until it became recognised in standard artistic circles: several museums took down his painted fences to exhibit them. 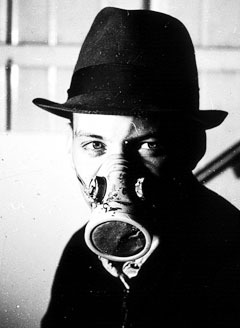 Phil Macquet’s agent introduced his stencils to art galleries. His works, which were designed to be exhibited in public, left the street and entered the world of art, with an elite following. Phil.Macquet felt the need for a new mode of expression. Phil.Macquet is also part of the generation that saw the birth of information technology and took part in its advent. More than just a milestone, to Phil, it’s the last great revolution that modern society has known. The first computer that Phil saw only had a black and white screen and seemed no more promising than a sophisticated calculator. Yet his off-beat way of looking at things meant that he saw it as a stimulating object, a way towards something fundamentally new, a path to be beaten. At the same time as his artistic studies, Phil began computer programming and was convinced that there was a way to combine art and IT. At the time, the idea was either seen as a heresy (« why associate the creative process of art with programmable machines designed to perform trivial tasks? »), or misunderstood as a wayward extravagance (“if it were a good idea to use machines for artistic creation, everyone would do so »). Despite the resistance he met, Phil.Macquet continued his research and set up several computer graphics companies. While paving the way towards computer assisted visual communication for his clients, he moved towards the exploration of digital artistic prospects to prove that the computer can be a brush: quite simply a modern-day tool. The arrival of Internet in the early nineties revolutionised information technology. Phil.Macquet discovered an abundant source of images that confirmed the close link between new technology and art. He began designing websites at a time when everything remained to be invented in the field. There were no fixed rules. He revelled in the public acclaim for the web and the world of technological graphics that he had always defended. Digital media were definitely the opportunity for Phil.Macquet to take his stencil work to a new dimension. He began creating compositions in the primitive colours that he previously used in spray paint and his first real Pixel Art series came to life. Yet the images remained imprisoned in the computer. The question was, how could the actual matter, the square pixels that had replaced the spray from his aerosol cans, come into their own? Was there a way of doing better than a printed photograph,–which could be no bigger than A3? How could the work leave the (still very small) screen while retaining its definition and the density of its saturated colors ? Soon, computer graphics and website design and the professional routine overtook creative liberty. But Phil.Macquet still considered IT as an artistic medium. He decided to concentrate wholly on a new period of pictorial research. The use of IT became accepted throughout the world, it was no longer associated with a loss of artistic value. The finished work could finally be considered as such with less regard for the way in which it was produced. So how was that going to affect Phil.Maquet’s future? First of all, improved techniques enabled Phil.Macquet to present his works in the way he had always wanted to. Next, as he no longer needed to fight to justify his methods, he was able to express himself freely, using his hallmark pixel as artistic matter and show that for a modern-day artist, to choose digital is to set down a marker. Over the centuries, artists have always tried to make progress by discovering new techniques and modern methods. For example, there was the arrival of oil paint in Italy or the first tubes of paint which enabled the Impressionists to leave the workshop and paint outdoors. To Phil.Maquet, digital has changed everything and he continually reminds us, in all his works, that we have yet to discover all the facets of the 21st Century brush. In a TV documentary shot shortly before his death, Andy Warhol began exploring the possibilities of a little 13 inch Amiga. The Pope of Pop was also on the road to digital. Phil.Macquet’s vision could not have met with more renowned acclaim.